Access: Route 3 roadside parking lot just south of the Sieur de Monts Entrance. Time Required: 2-3 hours, up and back. Length: 1.2 miles one way. 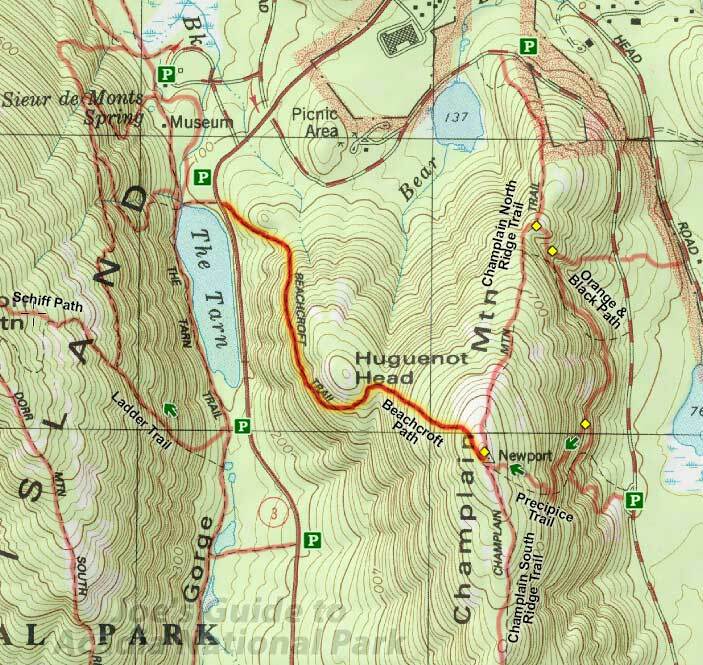 Elevation Change: 950-ft elevation gain to summit of Champlain Mountain. The trailhead for the Beachcroft Path is located along Route 3 roughly .2 miles south of the Sieur de Monts park entrance. A small parking lot is located on the west side of the road and the trailhead can be found right on the other side or the road. The trail heads southeast through some thick foliage gradually gaining elevation as it approaches the base of Huguenot Head. As the route clears the trees, things start to get more vertical as the path ascends the cliff bands of exposed rock. 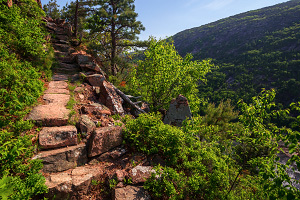 Many sections of trail consist of precisely placed slabs of granite that create easy-to-follow steps that zigzag unrelentingly up the mountain. Soon enough, the path levels off a bit and starts looping around the south face of Huguenot Head. Be sure to look back to take in the great views of The Tarn and Dorr Mountain to the west as well as the view to the south of the valley heading to Otter Cove. (Note: While the trail doesn't actually summit Huguenot Head, it is easy enough to leave the trail to hit the high point, but due to its domed nature, the views are actually better from the trail.) As you head east, Champlain Mountain now comes into view and the trail heads through a lovely little marsh located in the notch between the two peaks. 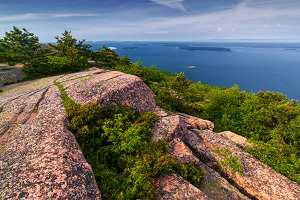 There may be more exciting sections of trail to be found in Acadia National Park, but this is still a pleasant and fairly short hike with some great scenery. The trail's best views are under Huguenot Head looking back at The Tarn, so take some time to enjoy this section rather than just racing to the top of Champlain Mountain.